“Human rights violations in Kashmir perpetrated by Indian army with legal immunity dwarf in scale the violations that provoked international humanitarian action in other international disputes. Human rights violations in Kashmir have been documented by all international and neutral human rights organization. Very recently, it was also documented in the United Nations report issued by the High Commissioner on Human Rights. The High Commissioner urged India to allow the United Nations delegation to visit Kashmir to asses the situation. But India does not allow such a delegation to visit Kashmir. It clearly shows that India has something to hide. May be, India does not want the world powers to know the following: tens of thousands indiscriminately slaughtered and countless rapes, abductions, custodial disappearances, arbitrary detentions, arsons, and brutal suppression of peaceful political protest,” this was conveyed in a message to the conference attendees of Pakistani American Society of New York (PASNY) by Syed Ali Geelani, Chairman, All Parties Hurriyet Conference, Jammu & Kashmir. The Indian army is involved in serious war crimes. They open fire on unarmed civilians at their will because they have been given immunity under draconian laws, like Armed Forces Special Powers Act. (AFSPA). We demand an inquiry into these war crimes by a neutral agency, like the United Nations, Mr. Geelani added. 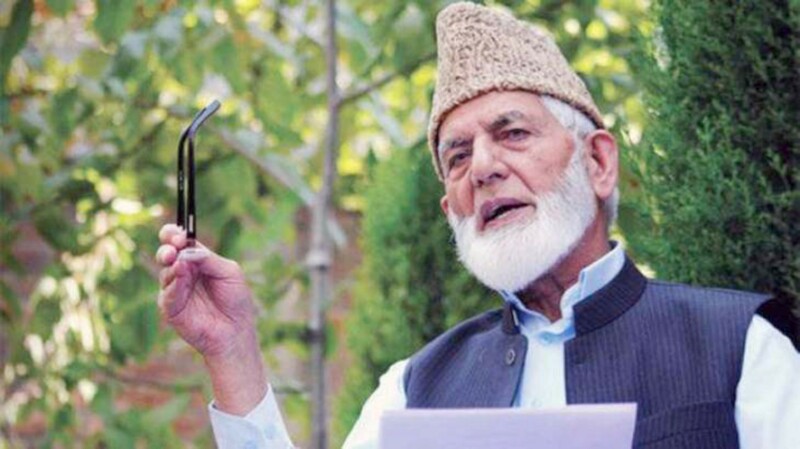 Geelani Sahib insisted that the movement in Kashmir is indigenous, popular and people’s movement and rejected the notion that it is Pakistan sponsored. Speaking as a guest speaker, Dr. Ghulam Nabi Fai, Secretary General, World Kashmir Awareness Forum reminded the audience of the injustice, tyranny and inhumanity of the Indian military as it occupies Kashmir. He cautioned that at this moment in our historic struggle for self-determination, the Kashmiri people with poise, confidence and unity are taking their inalienable struggle in a new direction of non-violence and peaceful agitation. Dr. Fai reiterated that major challenge faced by activists interested in a peaceful, just and lasting resolution to the Kashmir problem was the manner in which world powers spoke for Kashmiris and not to Kashmiris. This form of hegemony was most pronounced by constructing a false history and destroying Kashmiri identity. How often do we hear outlandish statements like, ‘Kashmir is an integral part of India’ or ‘Kashmir is a bilateral issue between New Delhi & Islamabad.’? These statements do not exist in a vacuum. They are loaded and violent. This form of violence is more insidious, more difficult to confront, for it is attempting to indoctrinate Kashmiris about their past, their present and direct them to a future that does not belong to them. They had become the objects of history rather than the masters of it. Col. Maqbool Malik the Secretary General, (PASNY) reminded that it happened 71 years ago when Indian troops invaded Kashmir under the auspices of a fraudulent Instrument of Accession. British Scholar, Alistair Lamb has convincingly demonstrated that the Instrument was as bogus as an original has never been found, and there is no plausible explanation for a disappearance if an original had ever existed. Mr. Malik reminded the audience that the conflict began in 1846 with the illegal, immoral and inhumane sale of the historic state of Jammu and Kashmir to a non-Kashmiri Dogra family for services rendered to the British Raj. From that point, onwards, Kashmiri’s have long for self-determination. Yet, tragically, their legitimate aspirations were crushed with the grotesque, irregular and illegal ascension, by the brutal foreign ruler Maharaja Hari Singh who did not have the consent of the people. With the arrival of Indian soldiers – the historic Black Day of Occupation begins its most recent and insidious manifestation. Mr. Ashraf Aazmi, the President of PASNY and emcee of the event said that the world powers should exert its considerable powers of persuasion to mediate a peaceful conclusion of the Kashmir conflict with India, Pakistan, and the Kashmiri leadership. Bilateral talks and negotiations over Kashmir between Pakistan and India have proven sterile for 71 years, and nothing in that dismal equation has changed. Sardar Imtiaz Khan Garalvi said that October 27th is celebrated all over the world as the day of occupation. Today, we are observing October 27th as a day of grief and sorrow, because it was on that day in 1947 that India sent its army to occupy our land without the consent of the people and in defiance of international norms. He said that Indian forces are using brute and excessive force against unarmed civilians and taking revenge from innocent citizens. Sardar Taj Khan emphasized that Kashmiris will resist India’s colonial occupation for as long as necessary to enjoy their right to self-determination as prescribed by international law, the International Covenant on Civil and Political Rights, and a long series of United Nations Security Council resolutions that were agreed upon by both India and Pakistan and accepted by the International Community. Ms. Amna Taj Khan urged the leadership of India and Pakistan to include the accredited leadership of Jammu & Kashmir in all future negotiations. Any Kashmir solution that fails to command the consensus of the 22 million people of Kashmir, Amna underscored, is doomed to shipwreck moments after its launch. She however, emphasized that with Kashmiri participation, anything is possible. Without it, nothing is. Shahid Comrade of Pak USA Freedom Forum said that Kashmir continues to be a nuclear flashpoint in South-Asia, periodic eruptions will continue to risk the nuclear neighbors and violence will continue to chase the region unless the Kashmir problem is resolved to the wishes of the people of the state. Shahid believes that a just and lasting settlement of the dispute is possible only through tripartite negotiations between the Governments of India and Pakistan and the legitimate leadership of the people of the State of Jammu and Kashmir.